Why is my Leviton Motion Switch Getting Warm? Here’s a question from a site visitor regarding the installation of a Leviton motion sensor switch. I installed a Leviton, PR 180 motion sensing switch. I hooked it up to seven light fixtures. Its load rating is 40W/VA Min 500W/400VA Max. What does this mean? The switch gets quite warm when the lights are on for a while. Is that too many lights for the switch? How many lights can I run off the switch? What watts can they be? The most important piece of information here is the maximum watt rating of the device. It is rated at 500W, 400VA maximum, so the main thing to concern yourself with here is the 500W. If you are trying to run seven fixtures on this switch, the maximum wattage that each fixture can be is about 70 watts, with the total of all seven being equal to or less than 500W. Looking at the VA rating, assuming that you have a supply voltage of 120, then the maximum current that you can switch with this device is 3.33A (120V x 3.33A = 400VA). 2. Reduce the amount of fixtures that you want to control with this switch. 3. Buy another switch with a higher maximum rating. With most electronic lighting control devices such as motion switches and dimmers, being a little warm to the touch is normal, but getting noticeably warm is a sure sign that you have overloaded the maximum rating of the device. 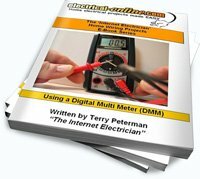 This entry was posted in Home Electrical How-To, Q & A, Wiring-Videos and tagged amps, maximum, maximum watts, motion switch, switch, VA, volts, wattage, watts. Bookmark the permalink.